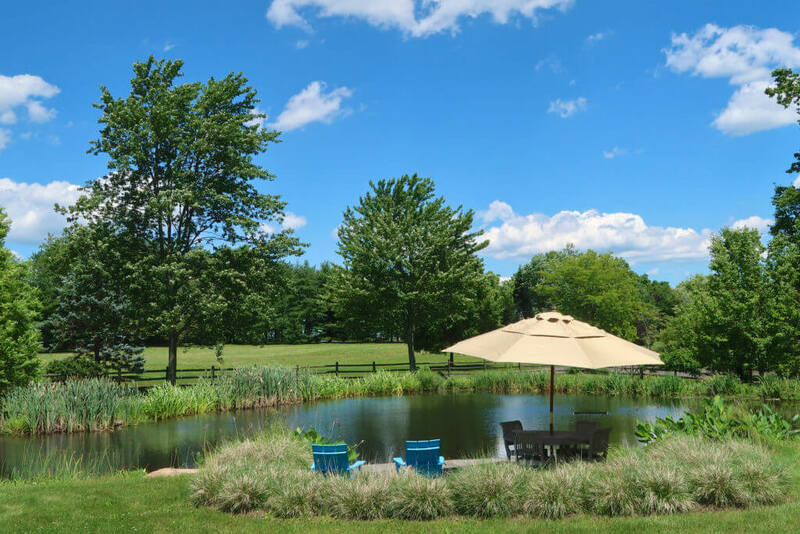 BROAD MEADOWS FARM IS THE QUINTESSENTIAL BUCKS COUNTY SANCTUARY. SET PRIVATELY ON 15+ ACRES, THIS PROPERTY CONSISTS OF A COMPLETELY RE-IMAGINED STONE FARM HOUSE WITH RENOVATIONS AND UPGRADES BY LOCAL ARTISAN BUILDER JARRETT VAUGHAN WHO IS KNOWN FOR THEIR EXCEPTIONAL CRAFTMANSHIP. 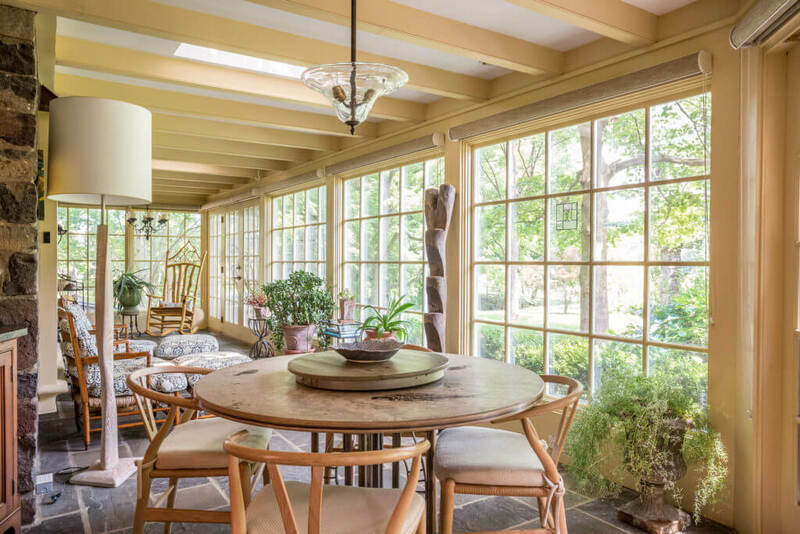 The home offers many of the original features one would expect in a Bucks County Farm home, magnificent wood floors, 4 fireplaces, walls of custom built ins, wide window seats, beamed ceilings, exposed stone walls and fabulous Venetian plaster wall finishes. There is also a sunroom with 3 walls of floor to ceiling windows and French doors leading out to a vine covered blue stone terrace for outdoor dining. A charming formal living room, den and a beamed dining room with hand painted wall mural, a large, bright country kitchen and butler’s pantry are also found on the main floor. THE FIRST FLOOR MASTER SUITE OFFERS SOARING CATHEDRAL BEAMED CEILINGS, A MASSIVE STONE FIREPLACE, A PRIVATE LOFT/OFFICE, MASTER BATH AND STEAM SHOWER. The master suite also offers private outdoor areas with a private walled in sun terrace, landscaped gardens and screened gazebo. The second floor offers a second full master suite as well as 3 additional bedrooms and 2 full baths. A NEWLY CONSTRUCTED POOL/GUESTHOUSE IS A MAGNIFICENT COMPLIMENT TO THE NEWLY BUILT POOL WITH A RESISTANCE LANE. The pool house with huge cathedral beamed ceiling offers one entire wall of floor to ceiling NanaWall Folding Doors which open out to a beautiful Travertine terrace overlooking the pool and gorgeous gardens. A full kitchen, lounging area, game room, separate gym room, sleeping loft, full bath, sauna, a magnificent outdoor stone shower and hot tub complete this area. Down a landscaped path leads you to the professional grade tennis court complete with sound system, lights for night play and an observation/sitting area. THE PROPERTY IS MADE UP OF SPECIMEN PLANTINGS, FORMAL GARDENS, MEADOWS, A POND WITH DECK, IMPRESSIVE HARDSCAPING AND A COVERED WALKING BRIDGE OVER A STREAM WHICH LEADS YOU TO THE ENTRANCE OF THE HOME. A large barn, garage and gated entrance all combine to complete this exceptional property. 75 minutes to NYC, 60 minutes to Philadelphia and 15-20 minutes to the towns of Doylestown and New Hope.